Ellen Pao, Reddit’s interim CEO, is making waves with an announcement that the company is eliminating negotiation of salaries for new hires. Instead, Reddit will state what they will pay, and the candidate will have to take it or leave it. She is implementing this policy to help alleviate gender pay discrimination. She states that men fare better in negotiations than women. She also makes the point that when men negotiate, they are seen as strong, while women who negotiate are seen as confrontational. While both these factors may play a role in gender pay inequality, eliminating negotiations is no way to fix it. In Kurt Vonnegut’s story, Harrison Bergeron, the title character is strong, smart and handsome, but lives in a future dystopia where everyone is supposed to be the same. So he is covered in metal to limit his strength, made to wear headphones that play noise to give him headaches to counteract his intelligence and forced to don black caps on his teeth and a red nose to hide his good-looks. By bringing him down to the lowest common denominator, he becomes equal with everyone else – equally weak, equally stupid, equally ugly. A satire, of course. But what Pao is trying to do with pay negotiation isn’t all that dissimilar. What she is saying is that something that may give one person the edge over another must be eliminated in the name of equality, even if it is beneficial. And negotiating pay is beneficial. Since future pay is usually based on a percentage of current pay, starting off higher will mean greater earnings over time. In addition, most employers expect you to negotiate, and in fact may even provide a low initial offer knowing you’ll come back with a counter-offer. Not doing so will mean an even smaller paycheck. 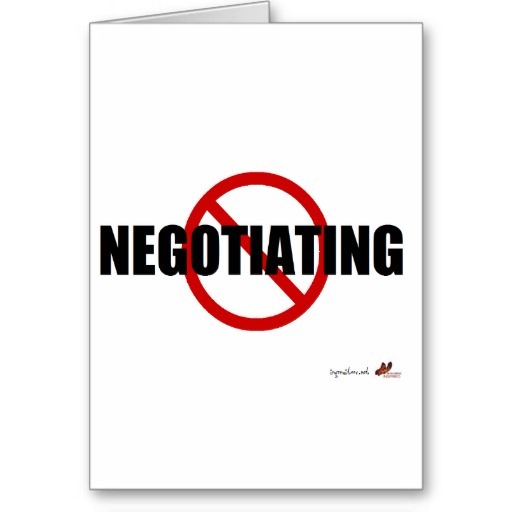 The negotiation process is also helpful to the employer. Pao states that Reddit will provide fair initial offers, but how will they know what’s fair? You can conduct all market analysis you want and probably get close to appropriate pay, but the right pay for the right position is a moving target. One way to hone in on this target is through negotiation. If the initial offer isn’t high enough, the employer will welcome the ability to up the offer through negotiation rather than lose out on a great candidate. Now, Pao would probably argue that this situation is different, because studies show that women disproportionately lose out when it comes to negotiating salaries. But I would argue that, while this may be the case overall, it is not always the case. Women are often able to negotiate higher salaries while still coming out appearing positive and professional. I’ve dealt with hundreds of them over the years. One of the last ones was a manager being hired to fix a troubled area. She was a great negotiator. We ended up paying her more, and rather than think her troublesome, we thought, this is the kind of person we need in this role. Now, I’m not saying gender biases don’t exist, and that employers don’t need to take steps to ensure that these biases don’t prevent them from hiring the best possible people. What I am saying is that if negotiating is an issue, we need to train people, men and women, to negotiate in ways that get them the pay they deserve without making them look bad. If the only way to eliminate the negative affects of negotiation on gender equality is to take the Harrison Bergeron approach, than why don’t we just take it to its ultimate end, as Vonnegut did in his story? All gender identifiers, such as names, could be eliminated from resumes. Interviews could be conducted in confessional-like booths, so employers couldn’t see if the candidate’s gender. The voice could be disguised like whistle blowers on TV investigative news shows so that employers couldn’t even hear if it was a man or a woman. Pao and others say that telling women should be better negotiators blames the victim, but this simplifies the issue. It makes it sound as if the misogynistic leaders of the world are all sitting in a back room somewhere, playing poker, drinking whisky and smoking cigars while they conspire to keep women down. The problem is much more nuanced than that, and nuanced problems require comprehensive solutions where everyone shares responsibility. In her pie-in-the-sky world, we would have a pure meritocracy, where your knowledge, skills and experience determine what you earn, and your ability to negotiate a better offer wouldn’t be a factor. That would be nice. But we don’t have such a system, and, humans being what they are, we probably never will. No matter what she may do at Reddit, negotiating will continue to be part of the hiring process, and if men and women want to get the best deal for themselves, it’s something they can’t afford not to master. This entry was posted in What's New and tagged Ellen Pao, Equal Pay, Harrison Bergeron, Negotiate Salaries, Negotiation Salaries, Pao, Reddit CEO.